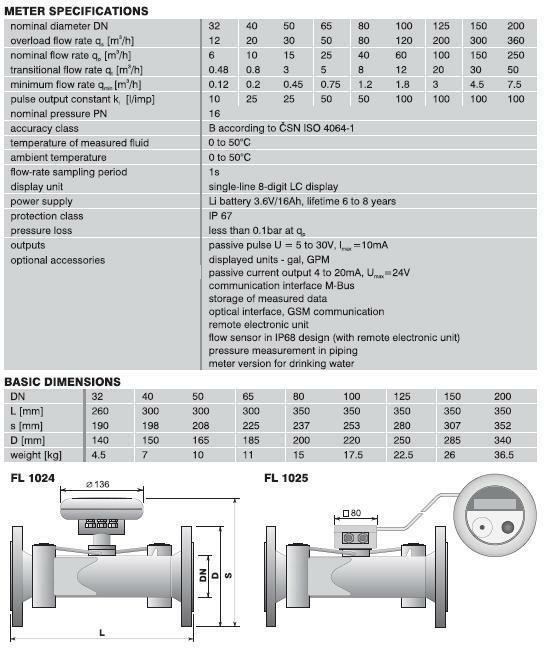 Battery-powered ultrasonic water meters of the type series FLOMIC FL102X (FL1024 – compact version, FL1025 – remote version) are intended for industrial and commercial applications in water supply systems. Where they provide for measurement of instantaneous flow rate, pressure, and consumption of water, as well as storage of the measured data. The meters utilize the principle of different propagation speeds of ultrasonic signals if directed in and against the direction of water flow. Ultrasonic water meters are noted for high accuracy and long-term parameter stability over a wide range of measured flow values. The FLOMIC water meter does not need any external power source, no moving parts and, compared to conventional meters, significantly lower hydraulic losses. The electronic accessories of the water meters make possible measurement and display of instantaneous flow rate, pressure and total volume of water passed through the meter since it was reset last time; the flow data measured at pre-set intervals can also be stored and communicated via the optical interface to a portable PC where they can be retrieved. The FLOMIC water meter also includes pulse and current (4 to 20 mA) outputs.